My Threadbanger roundup on Friday was Drinks for Winter Warming, and ever since then I’ve been excited to try some yummy hot drinks. I thought the White Spiced Coffee on delish sounded so good, but the super crazy time-consuming recipe involves simmering the crushed coffee beans in a saucepan (not up to leethal “recipe” standards! ), so I combined some ingredients from that one with a Christmasy Coffee recipe given to me by Diane, with my own additions, and this is what I made (and very much enjoyed)! Make the coffee as you normally would (I use a regular drip coffee maker, but it would be even yummier using a french press I’m sure!) except add some cinnamon, cloves (not much), and orange peel (more) mixed in with the grounds. If you have a cinnamon stick, then add only a little or no cinnamon, but if not, then add a whole lot of cinnamon with the grounds! 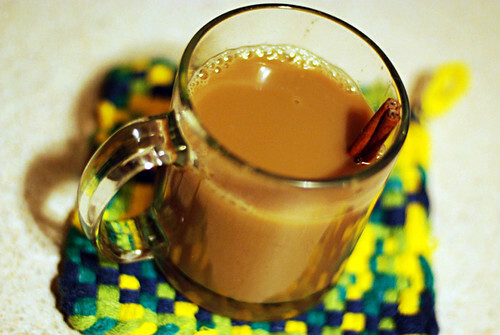 Now pour your spiced coffee into your mug and add milk – as much as you like, or a little more than you’d normally add. Stir the milk in with your cinnamon stick! Now stir in some honey, as sweet as you like it! Last, add some optional rum if you want your yumminess adult-style. Keep the cinnamon stick in there and it’ll get spicier as you drink it! Enjoy! Mmmmmm. I have no idea how many people there will end up being – it gets to be just too much effort if there are more than about 25 people, so I’m kind of hoping for a low-ish level of interest. Also, it needs to be restricted to US only, because of postage, sorry everyone else. But you can organize a swap like this in your own country! 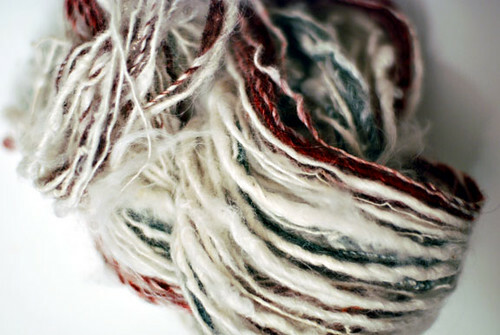 So, right now all I’m doing is putting the idea out there – if you are interested, or might be interested, email me at leethalkoala at yahoo dot com with something like “winter mix swap” in the subject, by Thursday night at 8pm (Portland time). I’ll see how many people express interest, and I’ll send out a follow-up email to let everyone know about how many people there might be, and then if you want in for sure, you’ll confirm then. So, emailing me now does not mean you’re committing, but please only email if you think you probably want to do it, so that I have a semi-accurate idea of the swapper number. As for some specifics, if you need more info to decide whether you’re into it… I’ll be making up a .doc file with every participant’s name and address, so we can all print that out to attach to packages for easier addressing. You can totally include anything else you want with your mix packages (like a business card for your website, or anything else like that) – the only requirement is that each package for each swapper includes a copy of your mix CD with packaging/artwork. There are other ways to fold cardstock into CD cases/envelopes, or you could experiment to figure out your own weird way of making cases. Mix CD packaging doesn’t have to be a big deal, but be creative with the artwork, because it’s fun! So yeah, let me know if you want in (or might want in) via email – I’ll be doing all the swap organization and communication through my yahoo email, so even if you let me know via twitter or elsewhere that you’re interested, please still send me a quick email. Thanks! And comment if you have any questions or confusion, and I’ll answer in the comments for all to read. gifts for 5 men, ages 20, 22, 24, 29, and my dad. and my mom. some details about the guys… all 4 are musicians and way into music. there’s a tattoo artist into bikes, hip-hop dj into film and basketball, computer programmer into irony and nerdiness, and pete who loves things involving squids/cephalopods/cthulu, robots, old-school audio stuff, any audio recording stuff, any keyboard/synth/moog stuff, trivia, weird things, history that nobody knows, mac stuff, old video game stuff…. and as for my parents, hmm they are always kinda tough for gifting, just show me what you have and i’ll check it out. if you might want to arrange some swap action, email me! leethalkoala at yahoo dot com. yay thanks!! and then on next saturday, the 6th, the 100th monkey studio twilight art sale. this one will have door prizes, sweets, bubbly beverages & treats, free massages, and possible live music. should be a super fun event! it’s in se near burnside +16th. 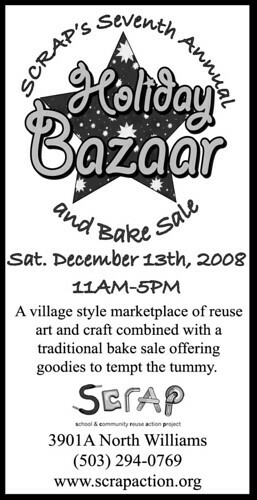 and a week later, on saturday the 13th, there’s the scrap holiday bazaar! 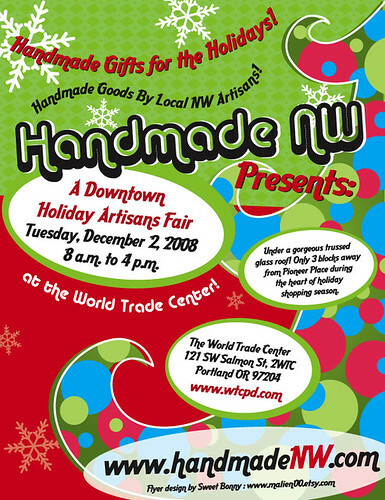 i did this sale last year and it was great – some really excellent work made from recycled materials! i’m super happy to be a part of it, i love scrap so much!! 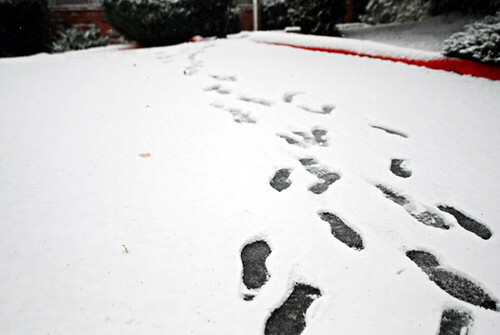 ok i need to get to work – soooo super busy this time of year!! i’m crazy happy to get to go home to my family for a week+ in december! yet another benefit of not working a day job in retail. i haven’t not worked on black friday and xmas eve day in years! 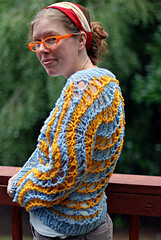 so i need to stay overwhelmingly busy until the 17th, then i’ll get a week of relaxation, knitting, and destressing. happy buy nothing day and make something day, everyone! zine overload and i knit a sweater! 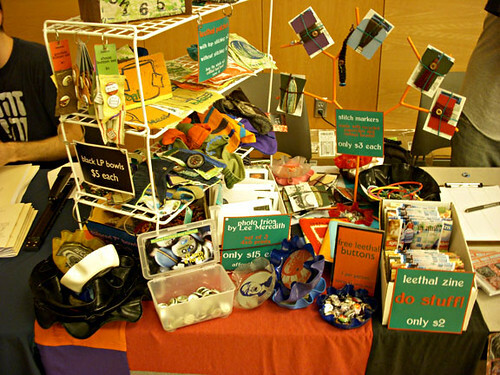 while it felt similar to a craft show, it was pretty different from what i’m used to… i only sold small stuff – zines, buttons, patches – and i did a ton of swapping! i met a lot of awesome people and it felt rad to be a part of the event, it had a real community kind of feeling. so, wanna see what i got? everything was traded! all three of those – arts & crafts revolution vol’s 1+2 and rip, stab, stitch – are by terri anderson of vancouver, bc and are flipping awesome! rip, stitch, stab is a long, detailed book-binding how-to zine, full of hand-drawn illustrations and fabulous ideas. 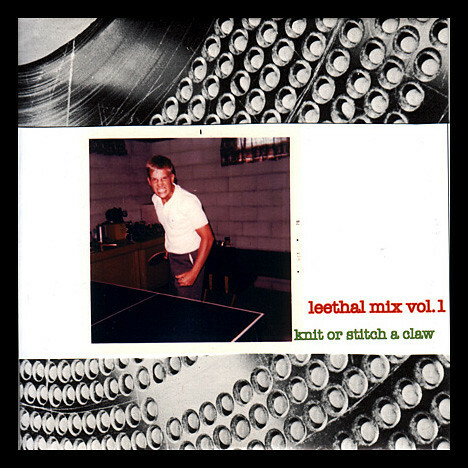 the first vol. 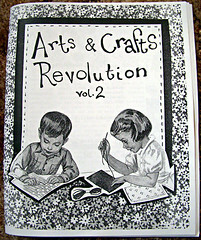 of arts & crafts revolution is a cute little one that states on the first page: “this is mainly a zine of ideas… a jumping off point. not an instruction booklet.” heck yeah! my kind of craft zine for sure. and vol.2 is a big fat amazing crafty book of awesomeness! including: basics of sewing, knitting, stamping, screen printing, sections on “thrift craft” and “enviro crafts”, how-to’s on yarn scrap dryer balls, craft apron, record bowls, a big section on “damn the man crafts” (“dismantle the system… one stitch at a time!”), and lastly, diy kink. 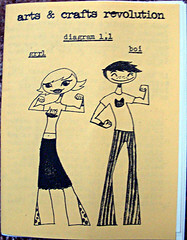 holy crap this zine is rad, the only problem is, i don’t know how you can buy it! i can’t find a website or any online distros that carry any of these. so, i don’t want to post terri’s email here on my blog, but if you leave a comment or email me i would love to give you her email so you can order a copy from her! 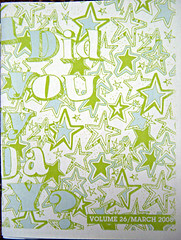 those two don’t go together, just trying to group pictures… the first one, “what did you buy today?” is volume 26 of the obsessive consumption zine by kate bingaman-burt. i had read about kate on diane’s blog so i was super excited to see her at the event. i really love her drawing style, makes me want to draw more like i used to back in college. 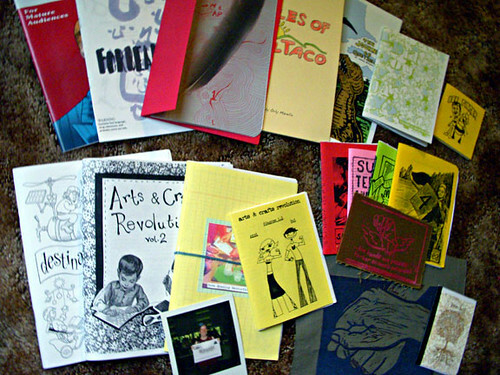 it was so hard to choose one zine for the swap – there were something like 32 issues, all with different gorgeous covers. 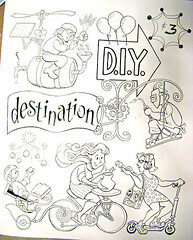 destination diy is the zine about the podcast of the same name, which used to be “diy portland” and is one of the many reasons we moved up here! i got to meet julie sabatier and she was super awesome and nice, and i even got mini-interviewed for the podcast, although i think what i said was kinda dumb so i doubt i’ll be on. (“what’s your favorite thing about the portland zine symposium?” “umm, i don’t have a favorite thing, i love the community feel of everything…..” something like that.) and i got a sticker to put on my car and show my diy pride! 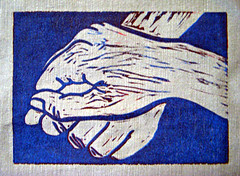 and, i did a swap with destination diy intern hilary galian for the hands print on fabric below (left). 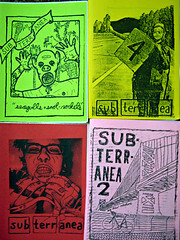 the brown+pink patch is by drew nowhere, who also gave me all 4 of his subterranea travel zines! 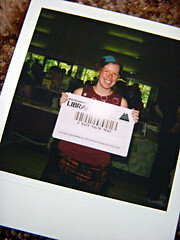 the multnomah county library zine people had a table 2 over from me, and they took polaroids of people with their giant library card all weekend, so on sunday before it was over i had to get one taken! yay library!! 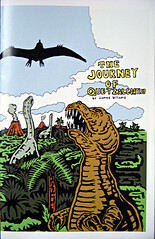 the journey of the quetzalcoatlus is by james williams, who was the other half of my table. we had actually met before, at the library zine social a few months ago, so it worked out well that he ended up sharing my table. he was nice about watching my side while i walked around a little and stuff. 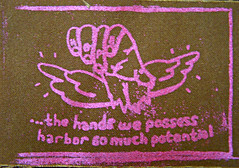 his comic zines are pretty rad, great artwork, and that one is educational too! oh and he drew me while bored on the first day, hehe. i wish i’d done some walking around and trading on saturday, i think i missed out on a lot. i met sam of chickeney on saturday, who had bought some buttons from me awhile back, and she got some more, and i’d planned to check out her stuff on sunday but i didn’t see her there. but, i was kind of hurrying and overwhelmed with all the stuff to check out, so i could have walked right past her, and other cool things. 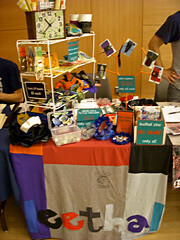 i didn’t want to be away from my table for long, so i didn’t do nearly as much trading as i wish i’d been able to do. oh well… i still got lots of neato stuff! if i try to close it in front it looks terrible, so i’m not gonna bother putting on buttons or a tie or anything. i might end up putting an edge around the sleeve bottoms. i copied raveler A-L and did the k1p1 trim all the way around the back, i’m glad i did that, it would be too short without it. i found a great dark red bulky sweater at the bins to unravel for my next sweater project, so now i need to decide whether to choose another twinkle pattern, or one from this book! 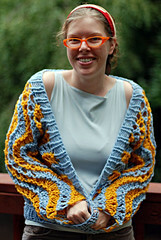 i’m sticking with fat-needle projects for now, i was way into how quickly that marilyn jacket knit up! 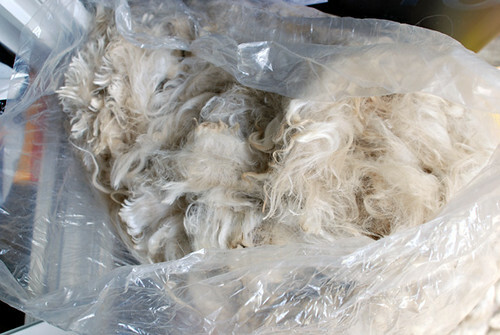 a few weeks ago i was given an amazing gift by my friend dianne: 11 huge bags full of alpaca fleece. it came from northwest alpacas here in oregon, and i’m pretty sure each bag is a full blanket worth (like, the entire alpaca), or close to it. 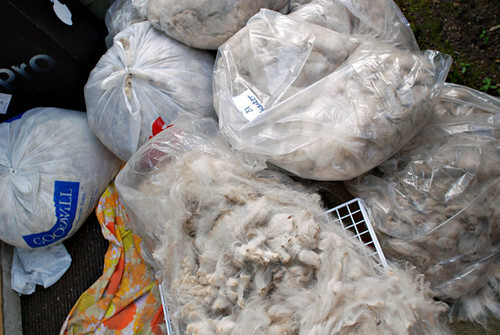 it’s not cleaned, so i spent a dirty day emptying each bag, shaking out the fleece, picking out any too-dirty chunks, and putting it into clean bags. i really loved seeing/feeling how each blanket had a unique look and feel, like i’m sure the alpacas themselves each have a unique personality, even though they are all white in color. 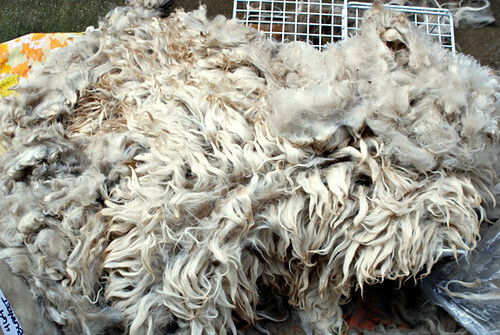 sooo, the thing is, i have way more alpaca fleece than i could possibly spin up in the next decade, so i’m looking for swaps! i definitely want to keep a bunch of it for myself, and i’d like to spread the alpaca love as widely as possible (so, i’m not wanting one person/company to take the whole lot), and i don’t want to sell it for money since it was given to me as a gift (that would just feel wrong). so, swaps! 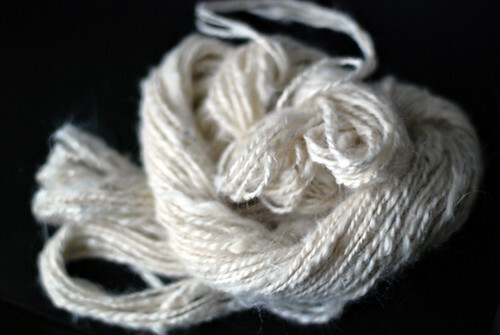 i would love to trade fiber for fiber, but i’ll definitely be open to yarn, handmade items, supplies, books… just let me know what you want to trade. leave comments or email me (leethalkoala at yahoo) with offers. yay swaps! 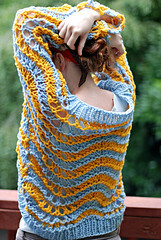 and, for non-spinning yarn lovers, i do indeed plan to spin up yarn to sell, so keep checking my yarn page for updates!